You can look at director Clint Eastwood’s version of Jersey Boys in a couple of ways. You can lament the fact that Eastwood’s movie misses some of the irrepressible energy that marked the musical’s many stage productions. Looked at another way, it’s possible to argue that Eastwood — not the most likely choice to bring a popular musical to the screen — does a workman-like job of balancing drama, comedy and musical numbers in telling the story of Frankie Valli and the Four Seasons, the ’60s group responsible for such hits as Sherry, Big Girls Don’t Cry, Dawn, Walk Like a Man and many more. For a reviewer, it’s frustrating to acknowledge that there’s legitimacy in both points of view, but I’ve seen the stage version and appreciated the fact that Eastwood isn’t interested in building his movie around in-your-face energy. Eastwood begins with the backstory of how the group formed and how Valli — actually Francesco Castelluccio — came to provide its signature voice, a famous falsetto that helped create the Four Seasons’ trademark sound. Jersey Boys works as a typical rise-and-fall story: The group struggles, becomes phenomenally successful and eventually falls apart amid arguments over money and control. John Lloyd Young, the actor who originated the role on Broadway, plays Valli, a kid from Belleville, N.J. who is portrayed as never having mastered the ruthless side of the music business. Throughout, Frankie remains faithful to a romanticized Jersey ethos of loyalty, friendship and neighborhood ties, even when his values cost him dearly. 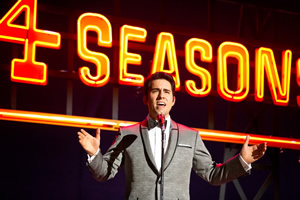 The movie also introduces us to Bob Gaudio (Erich Bergen), a young man who already had written a hit song (Short Shorts) when he joined the Four Seasons and who wrote most of the songs that put the group on the map. Vincent Piazza portrays Tommy DeVito, the guy who formed the group and who also squandered a lot of its money. Michael Lomenda plays bassist Nick Massi, who mostly seems content to hover in the background. The story makes room for other characters, as well. Christopher Walken appears as Angelo "Gyp" DeCarlo, a mobster who takes a liking to Frankie. Mike Doyle plays Bob Crewe, a gay record producer who helped put the Seasons on the map and who, in many scenes, provides comic relief. He’s from Jersey, but functions as the movie’s anti-Jersey Boy. And Joseph Russo plays Joe Pesci, the edgy actor who, in his early years, introduced Gaudio to the group. An almost charming Walken provides the glue that holds a pivotal scene together. Somehow, the group must deal with the fact that Tommy owes $162,000 to a loan shark. Gyp negotiates the deal that saves Tommy’s life. Eastwood takes an unhurried approach to the screenplay by Marshall Brickman and Rick Elice, who also wrote the book for the musical. He follows the basic format of the play, which finds each character narrating segments of the movie in what appears to be an effort to add Rashomon-like complexity to a story that really doesn’t really need it. The portrayal of the movie’s Italian-American milieu dips into caricature that doesn’t really let up until the latter going, when Valli begins to face a host of personal and career problems. Perhaps because he was looking for a way to make the material his own, Eastwood brings an element of wistful reflection to a story that’s usually presented in more upbeat fashion. Eastwood may have made a mistake in not doing more to showcase the musical numbers, the main reason anyone would want to sit through a story about these four New Jersey guys. There are other miscalculations, as well. When Valli sings My Eyes Adored You as a lullaby to his young daughter, the moment feels weird: The lovelorn lyrics ("Though I never laid a hand on you") don’t match the tender fatherly sentiment for which Eastwood must have been aiming. The main tension involves Tommy’s reluctance to admit that he’s not in control of the group. He can’t acknowledge that without Valli and Gaudio, there really is no group. A volatile Piazza plays Tommy as if he’s in a perpetual audition for a small part in Goodfellas. I wouldn’t say that Young has the makings of a terrific screen actor. He doesn’t have the kind of face that turns close-ups into intriguing explorations of character. But Eastwood needed someone who could replicate Valli’s voice and Young obviously knows how to do that. The songs weren’t lip-synched, but were recorded live. By the end, it finally becomes clear what Eastwood found admirable about the Four Seasons, the clarity of their tone when they were just four guys harmonizing under a lamp post in a Newark suburb. It’s a long time coming, but Eastwood gets there.